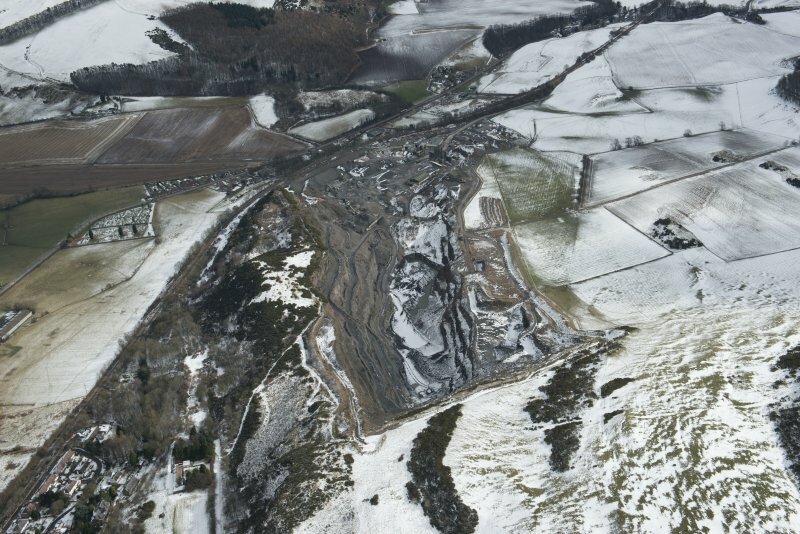 Oblique aerial view of Clatchard Craig quarry. 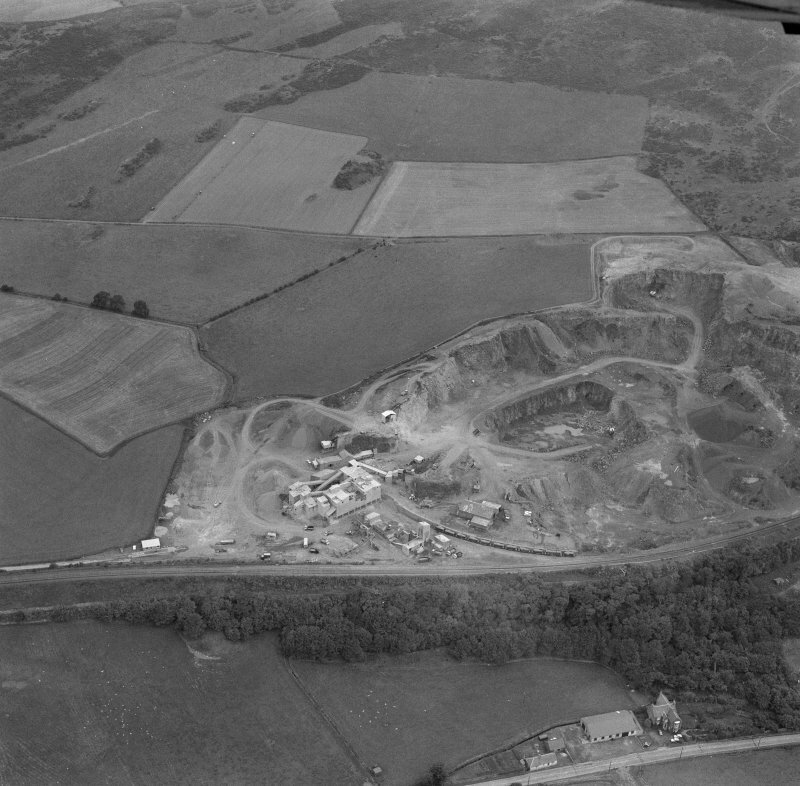 Oblique aerial view of Clatchard Craig quarry, looking E.
Oblique aerial view of fort. 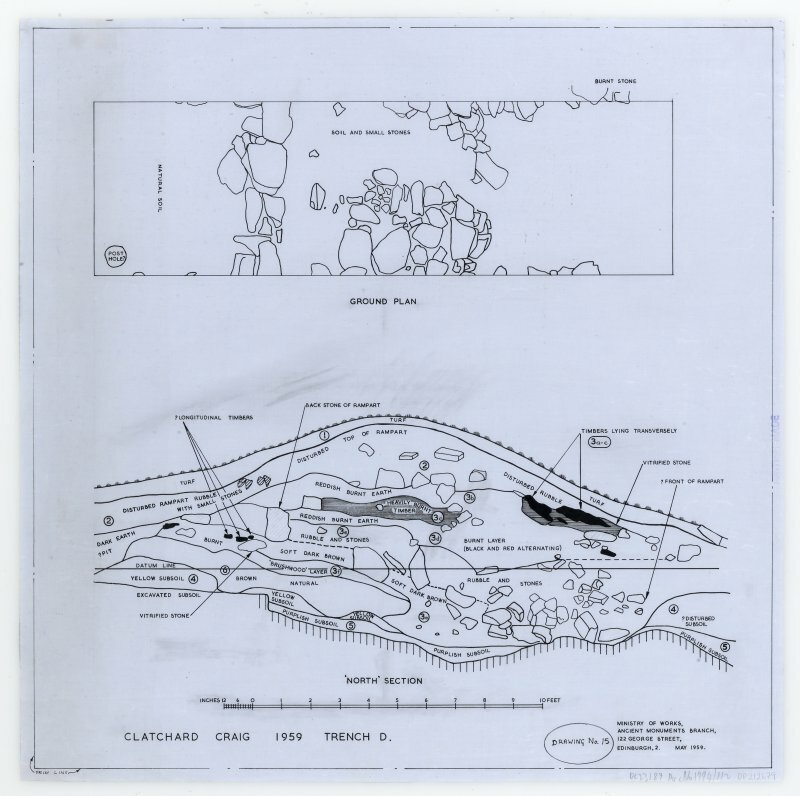 Published in RCAHMS Fife Inventory, figure 10. 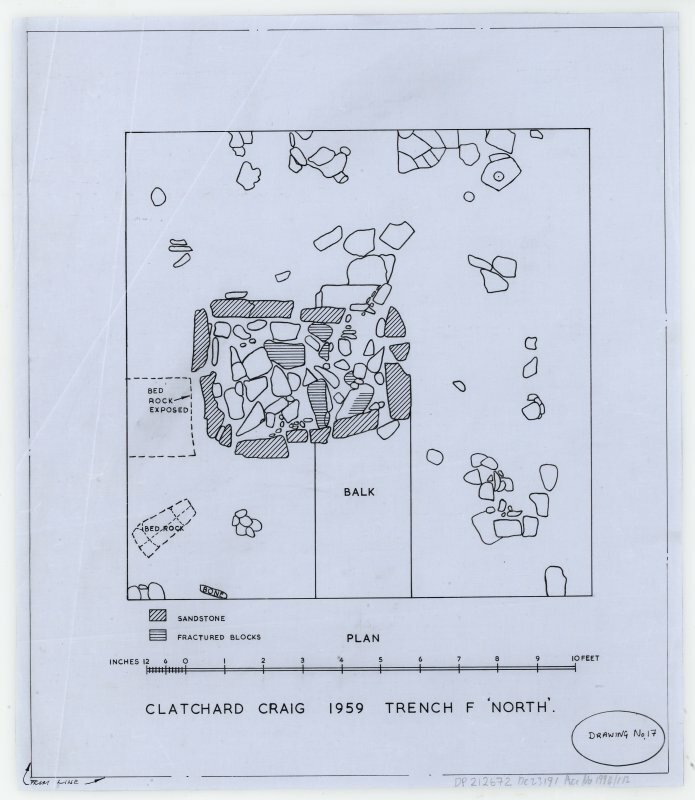 For cist and urn, gold finger-ring, carved stone ball, saddle quern and pottery from Clatchard Craig, see NO21NW 20, NO21NW 22, NO21NW 33, NO21NW 34, NO21NW 75 respectively. 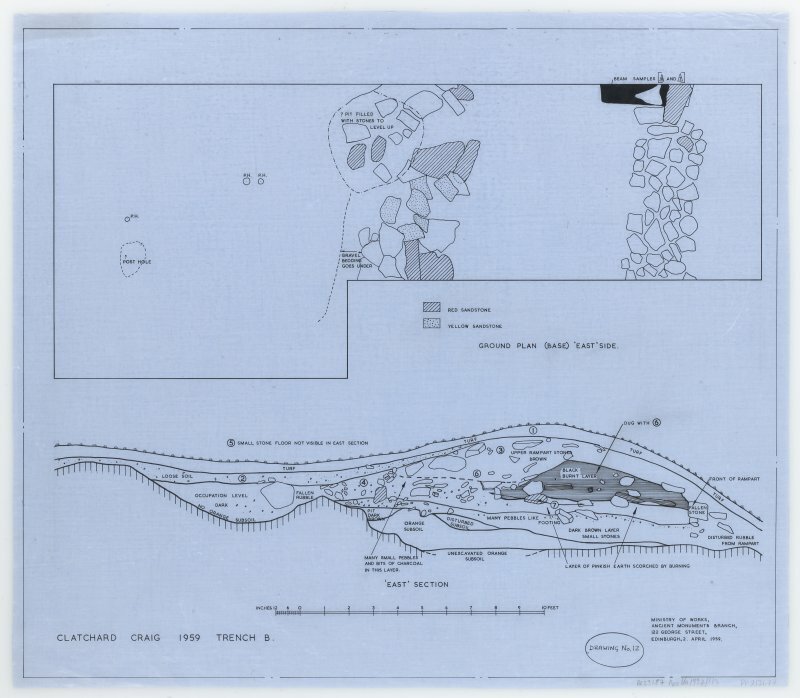 The fort on Clatchard Craig has now been quarried away, but rescue excavations, carried out for the Ministry of Works in 1954,1959 and 1960 revealed that it comprised three main structural phases, the latest being the sub-rectangular enclosure on top, which measured 230' by c. 115' from which relics of Dark Age date were obtained. This stood within a heavy oval rampart, 330' by 200'. The next rampart overlay a series of hearths in which pottery was found, and in this rampart was found masonry block with adherent mortar in which were fragments of tile. The third rampart, like the two preceding was timber-laced, later replaced by earth and stone, and at one point the stones were vitrified. There were a further two ramparts with minor additions and supplementary features. 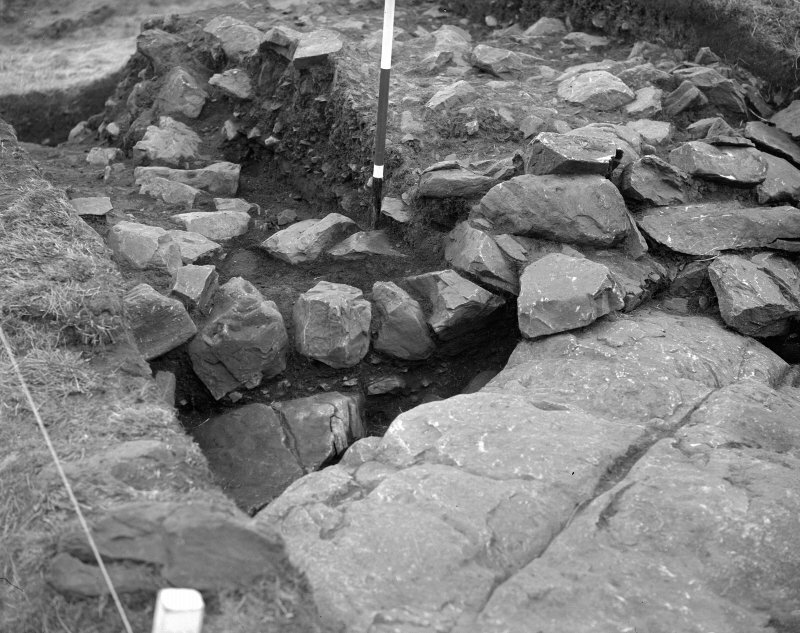 Numerous finds of IA date were made and are now in the NMAS. 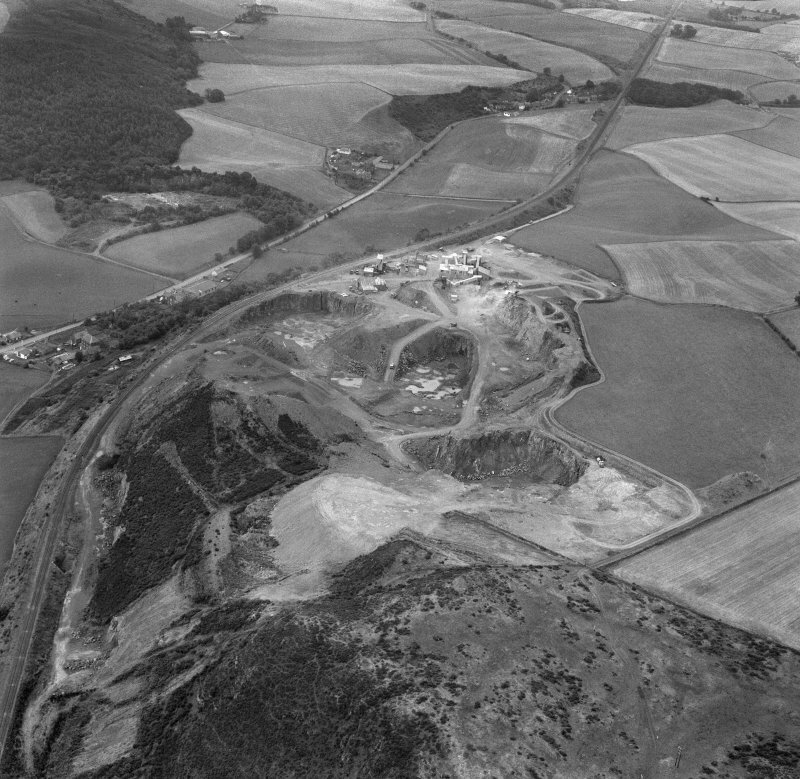 RCAHMS 1933; P R Ritchie 1954; S Cruden 1959; S Cruden 1960; R W Feachem 1963; R Butchard 1967. 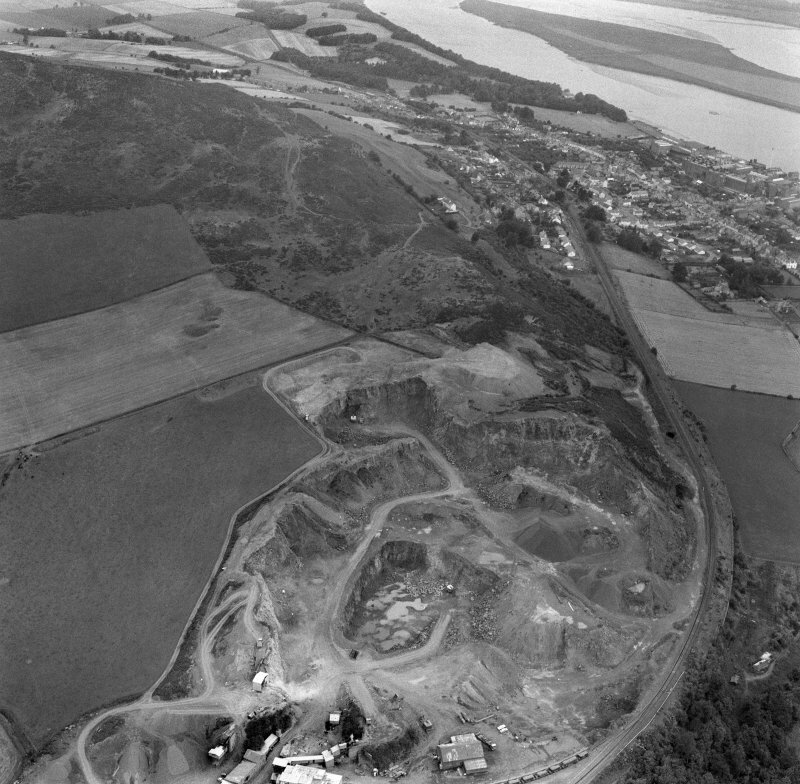 The fort has been completley destroyed by quarrying. 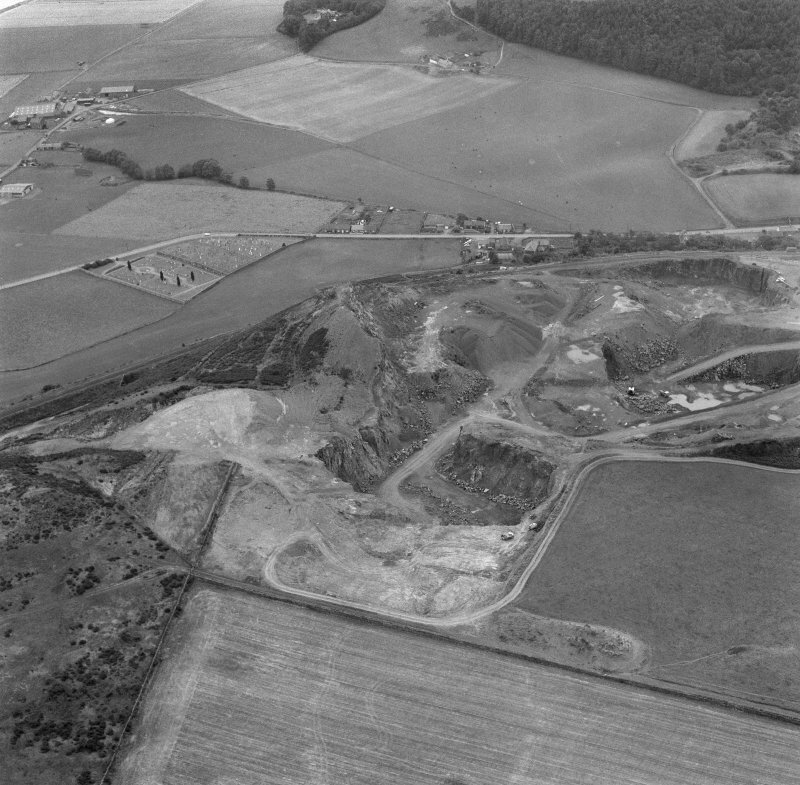 Defences trenched by P R Ritchie in 1953-4, and further excavation by R Hope-Simpson in 1959 and 1960; since destroyed by quarrying. Neolithic pottery found and burnt and broken flint tool of Neolithic or Bronze Age date. 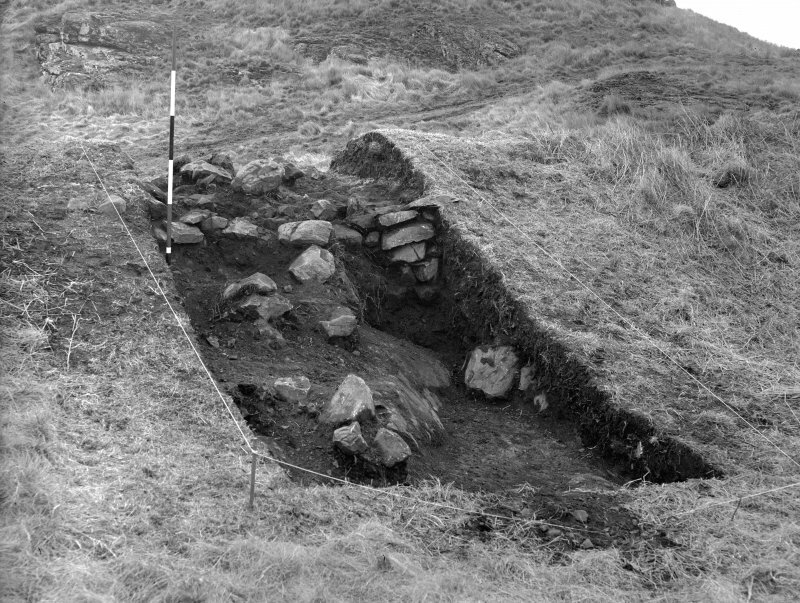 Iron smithing slag found in outer enclosure: may be of Iron Age or Dark Age date. Finds of Iron Age date; stone disc (possibly spindle whorl roughout), pottery, clay ball, bronze ring, shale ring, shale bracelet. Finds of Roman date or possibly so; Samian pottery, rotary quernstone. 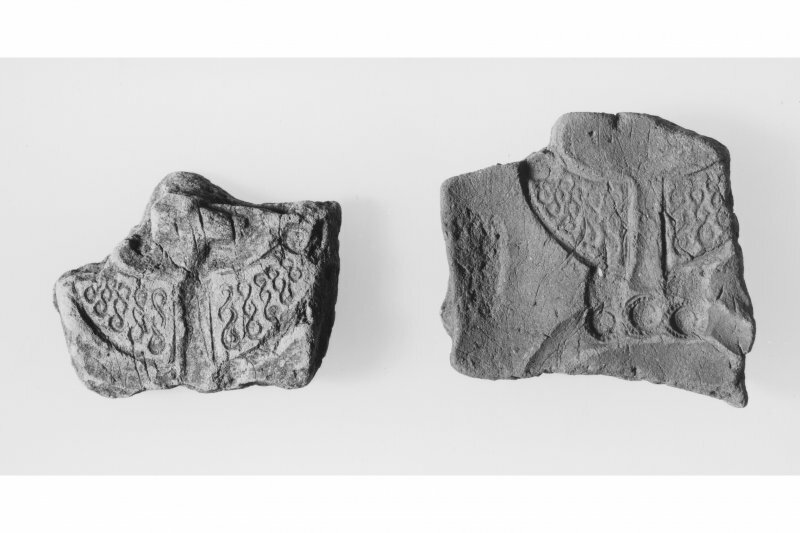 Dark Age finds; openwork ornament, pin from penannular brooch, small pelta-decorated disc, pottery (E-ware), clay moulds and metalworking debris, glass bead, silver ingot. 1 Earlier Neolithic pottery deposited. 2 Late Neolithic stone ball lost. 4 Limited occupation in the second-third centuries AD suggested by a few artefacts. 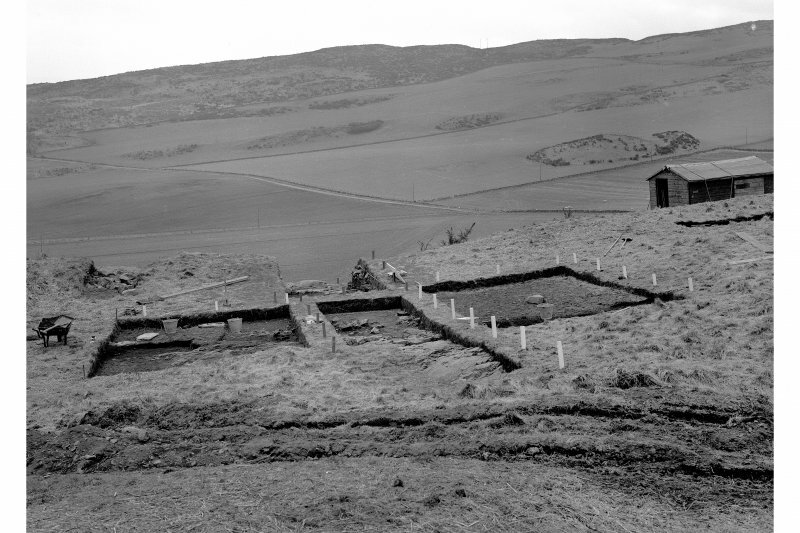 5 Construction of the timber-laced ramparts 1 and 3 in the sixth or seventh century AD; their subsequent destruction by fire. 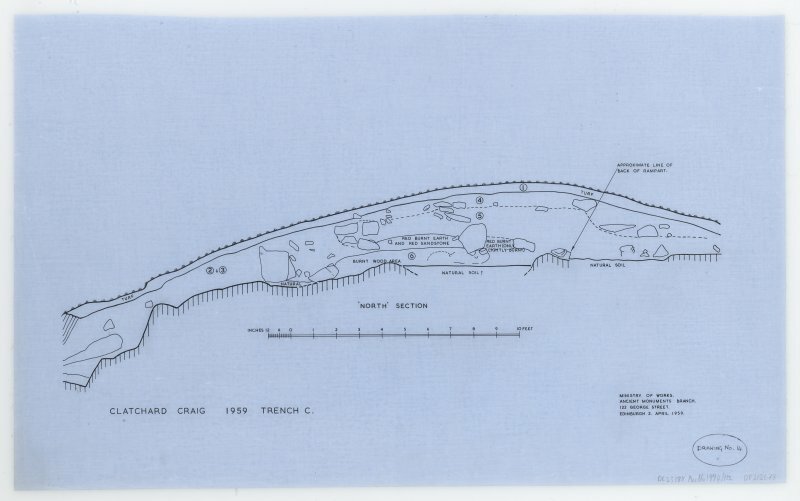 6 Construction of ramparts 3a-6, perhaps added to 1 and 3, more probably replacing them; perhaps two or more phases. 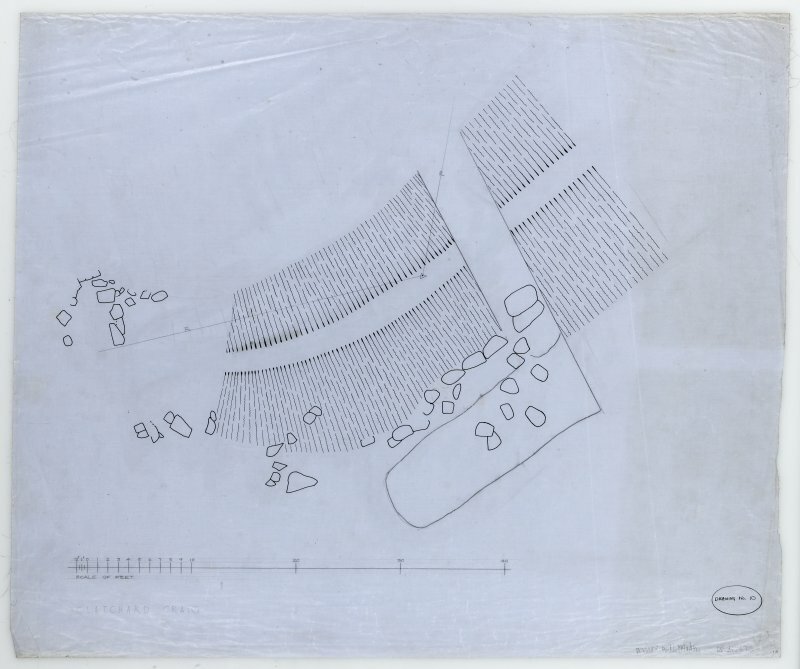 7 Occupation in the interior attested by finds including two sherds of E-ware, a glass bead, a scrap of imported glass, a pelta-decorated disc, animal bones and iron slag etc may be contemporary with one or other or both of the defensive phases listed under 5 and 6. 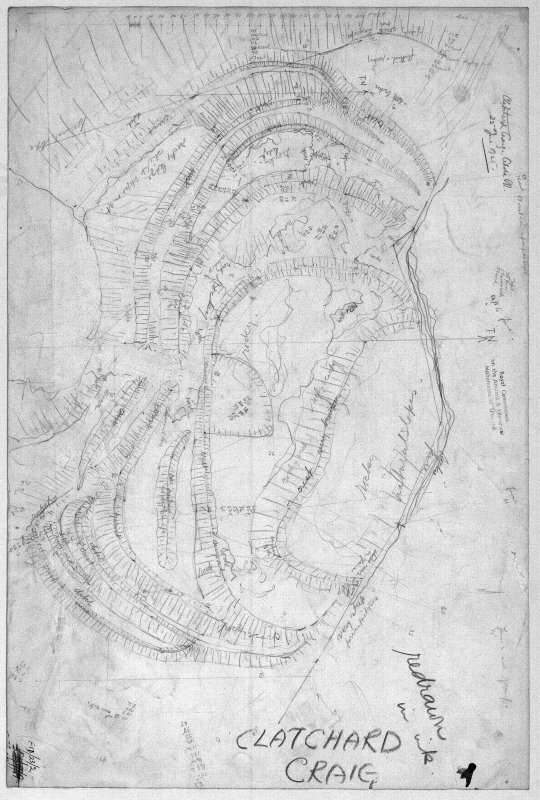 8 Construction of rampart 2 on a new line, perhaps after a break in occupation. 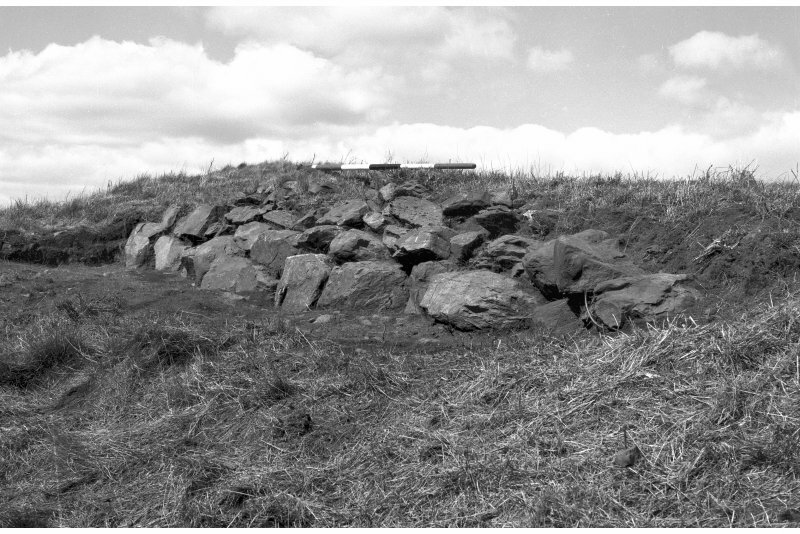 9 Final occupation in the upper enclosure, with the collapsed back of rampart 1 cut away. 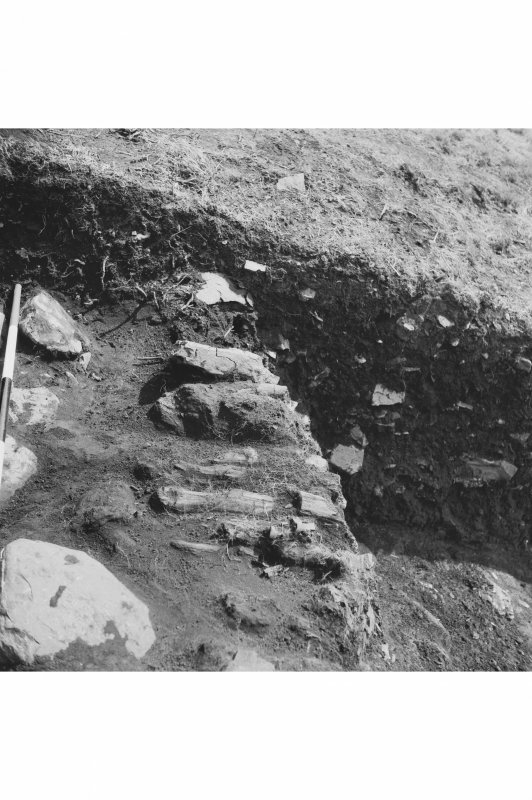 A short phase of fine metalworking activity in the eighth century AD succeeded by construction of a paved hearth apparently within a rectangular building. The relationship of this occupation to rampart 2 is unknown. 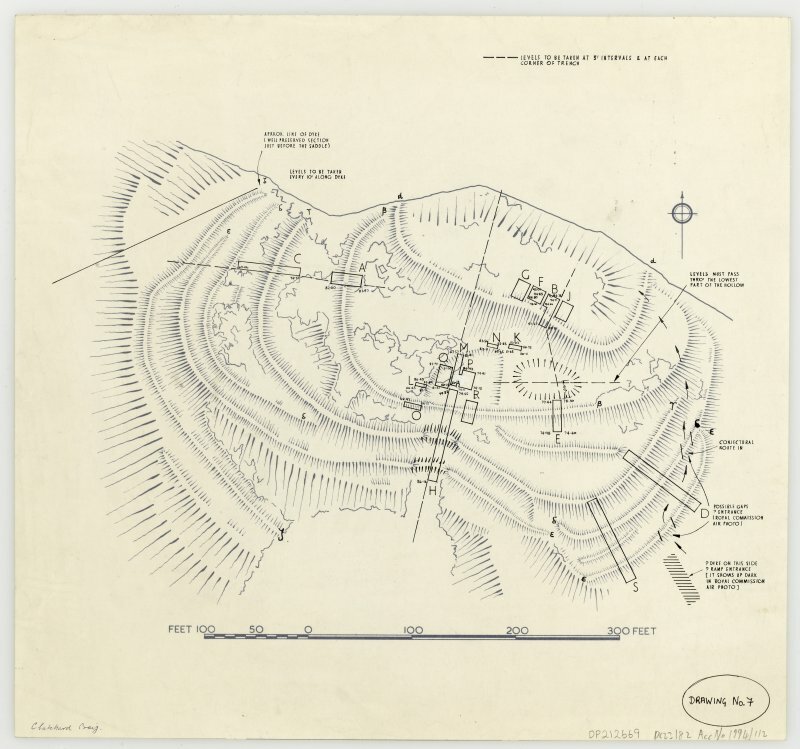 Non-Guardianship Sites Plan Collection,DC23176- DC23183, 1955,1959 & 1960. There is nothing to add to the plan and description given in the Inventory. 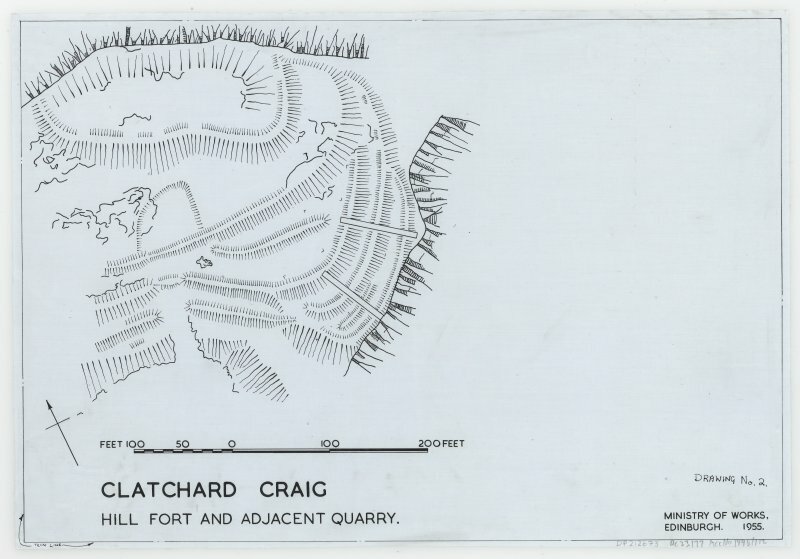 The fort on Clatchard Craig has now been quarried away, but rescue excavations, carried out for the Ministry of Works in 1954,1959 and 1960 revealed that it comprised three main structural phases, the latest being the sub-rectangular enclosure on top, which measured 230' by c. 115' from which relics of Dark Age date were obtained. 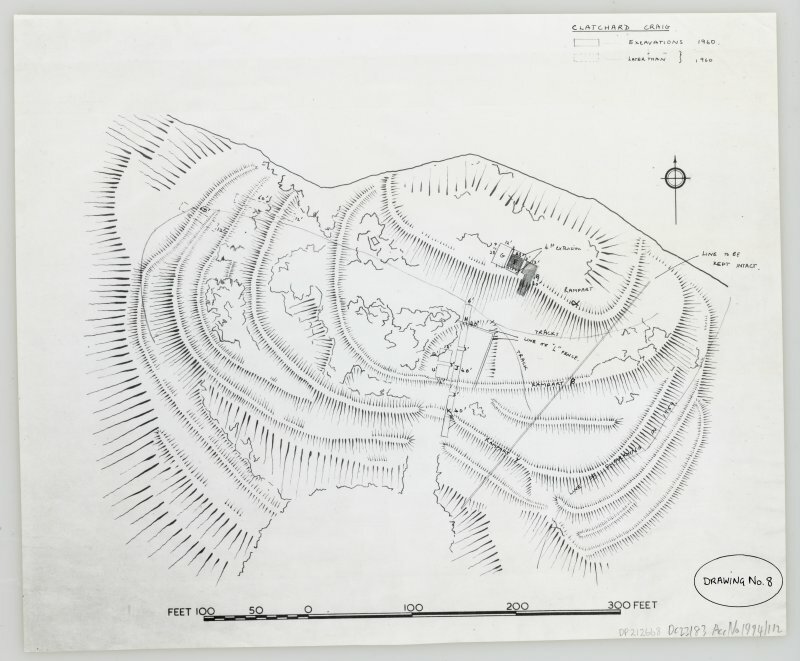 This stood within a heavy oval rampart, 330' by 200'. The next rampart overlay a series of hearths in which pottery was found, and in this rampat was found masonry block with adherent mortar in which were fragments of tile. The third rampart, like the two preceding was timber-laced, later replaced by earth and stone, and at one point the stones were vitrified. There were a further two ramparts with minor additions and supplementary features. 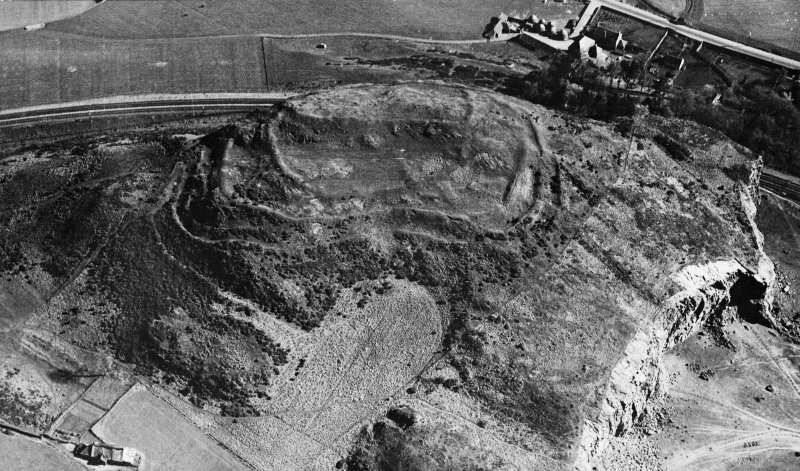 This complex fort occupied a prominent hill in the gap in the hills SE of Newburgh, but by 1970 it had been completely destroyed by quarrying. 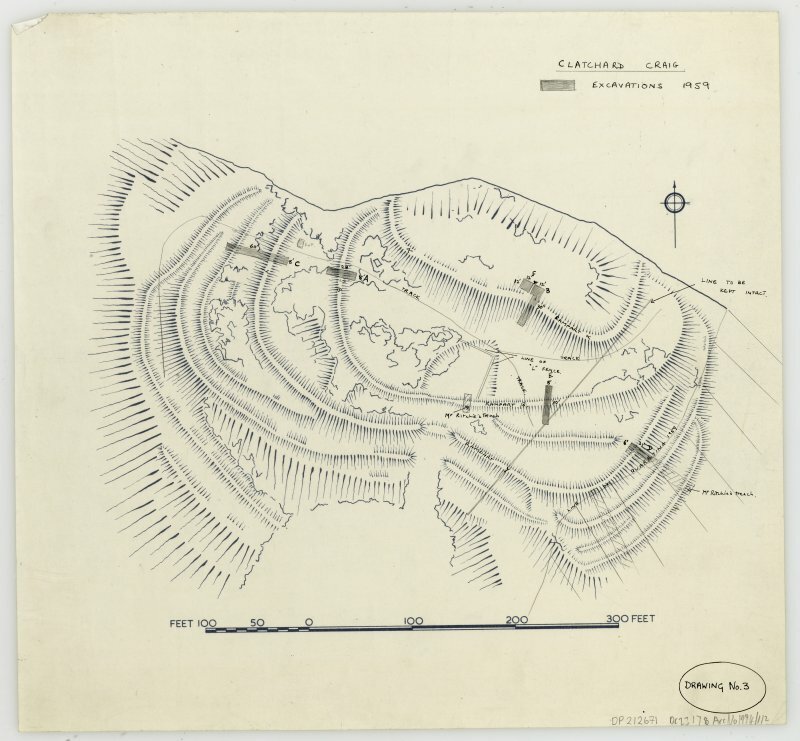 The N flank of the hill fell away in a precipice, but elsewhere the ground descended more gently in a series of terraces and was defended by a complex of ramparts. 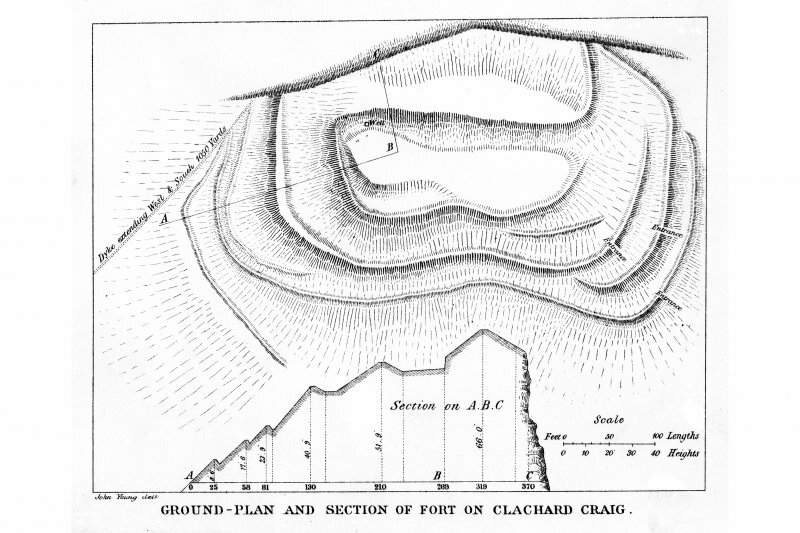 The plan drawn up by Charles Calder for the RCAHMS inventory remains the principal source for the configuration of these defences, and with modifications as a result of the excavations in 1954 and 1959-60, forms the basis for the plan accompanying the excavation report published by Joanna Close-Brooks (1986, 121, fig 3). Superficially, there appear to have been three eccentric enclosures, the outer of which is defended by three or four ramparts. 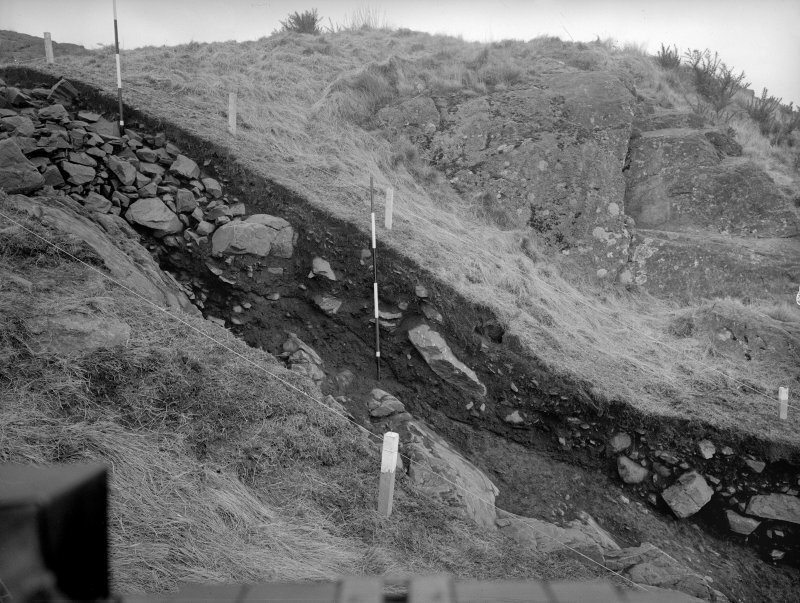 The innermost enclosure occupied the summit area, which was girt with a natural rocky scarp over 4m high and measured about 73m from ESE to WNW by 27m transversely (0.18ha) within a single rampart, which proved on excavation to have been laced with timbers up to 0.3m thick, with traces of longitudinal timbers towards its rear. Two radiocarbon dates of AD 390-640 and 540-880 were obtained. 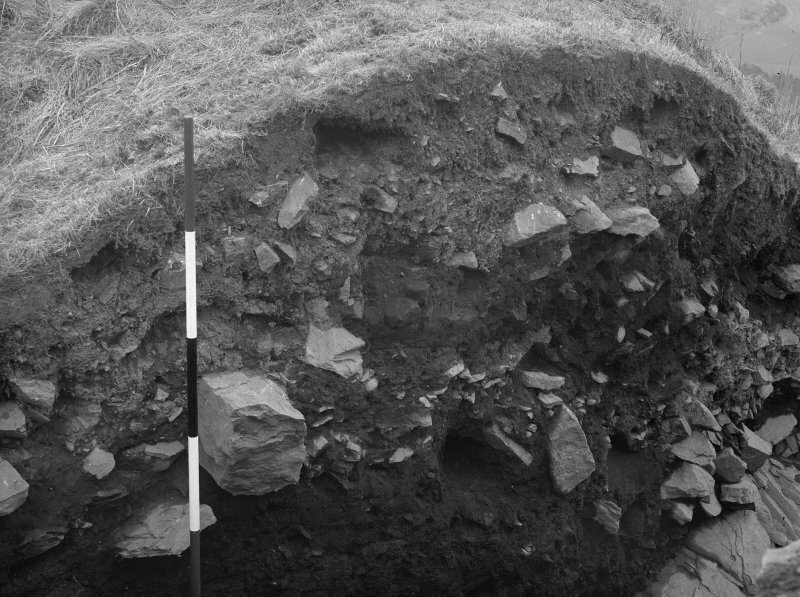 A floor and a paved hearth were probably buried beneath tumble from this rampart and overlay deposits containing clay moulds of 8th-century date; other mould fragments and a silver ingot were found beneath tumble nearby. The second enclosure that is distinguishable, is roughly oval and lies eccentric to all the other lines. 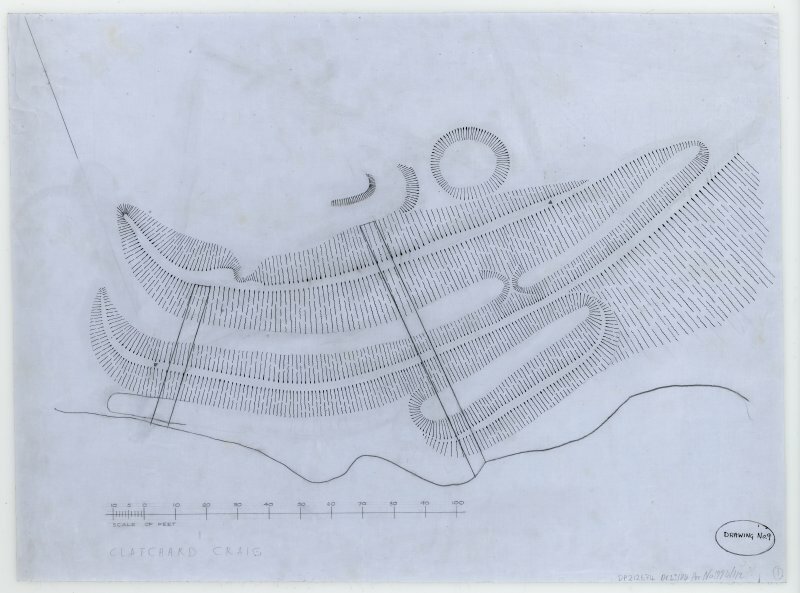 Its W half is clearly enough defined, looping from a point immediately outside the innermost enclosure on the cliff-edge round across a lower terrace on the SW, but its course towards the E is less certain, for though Calder drew it as a scarp swinging round below the ESE end of the innermost enclosure, across the line of the third rampart, there is little sign of it amongst the natural irregularities visible on the RAF aerial photograph. Nevertheless, it probably enclosed an area measuring in the order of 90m from E to W by at least 67m transversely (0.46ha). Faced roughly with stone, this too was apparently timber-laced, while six stones with mortar adhering to them from one cutting probably have a Roman origin; a sherd of Samian ware was also recovered from the body of the rampart. 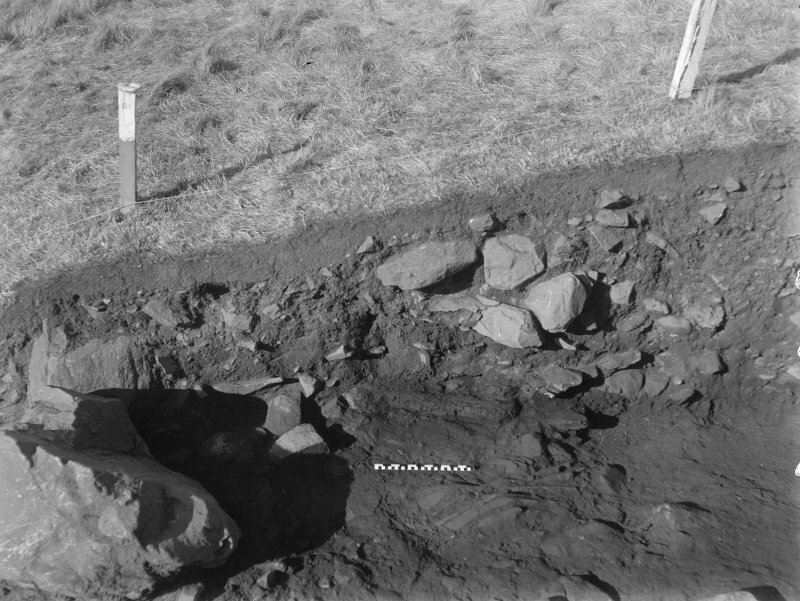 A radiocarbon date of AD 430-660 from charcoal within the rampart is indistinguishable from dates from timbers in other ramparts and led Close-Brooks to suggest this was a residual sample providing no more than a terminus post quem, but equally it may derive from rapid and successive phases of construction and destruction. 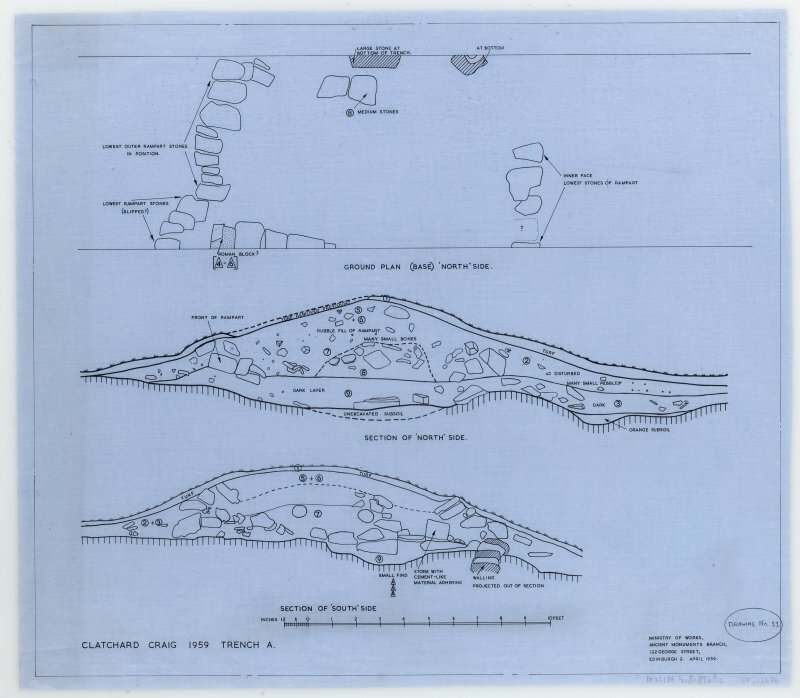 The third enclosure took in a larger irregular area measuring about 115m from ESE to WNW by 70m transversely (0.68ha) within a stone faced rampart laced both transversely and longitudinally with timbers, which had also been burnt; calibrated dates dates of AD 430 to 670 and 540 to 770 was returned. 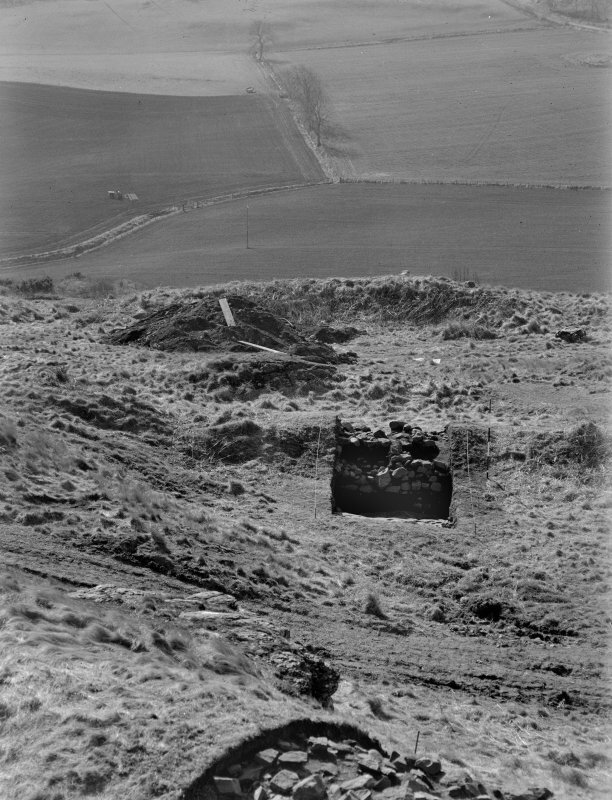 A mass of burnt timbers found lying in front of this rampart on the S was possibly the remains of breastwork and appeared to be overlain by tumbled stones from an outer rampart below it, one of up to four on the W and three on the SE. 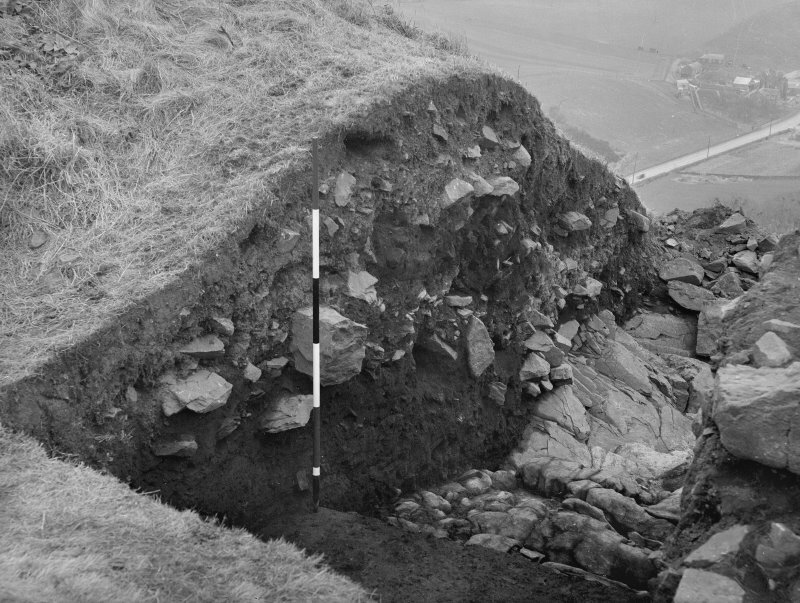 Whether this is sufficient evidence to date all these outer ramparts to the early medieval period is debated by Close-Brooks. 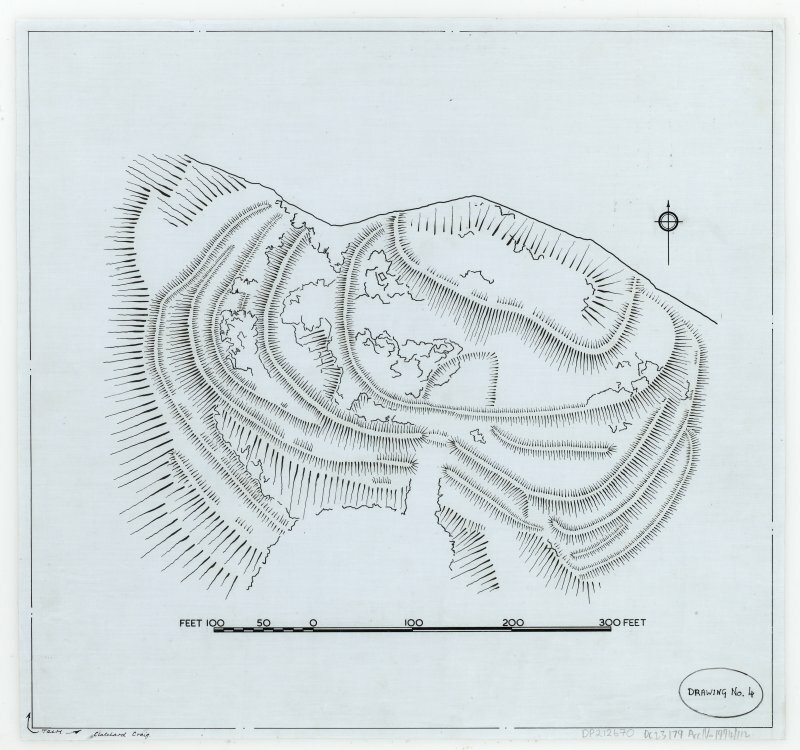 Suffice it to say that if there is an earlier fort here, as seems likely, its innermost rampart is probably followed the line of either the third rampart, or possibly the fourth rampart outside it; failure to identify earlier defences may simply be a function of the narrow trenches dug across them. 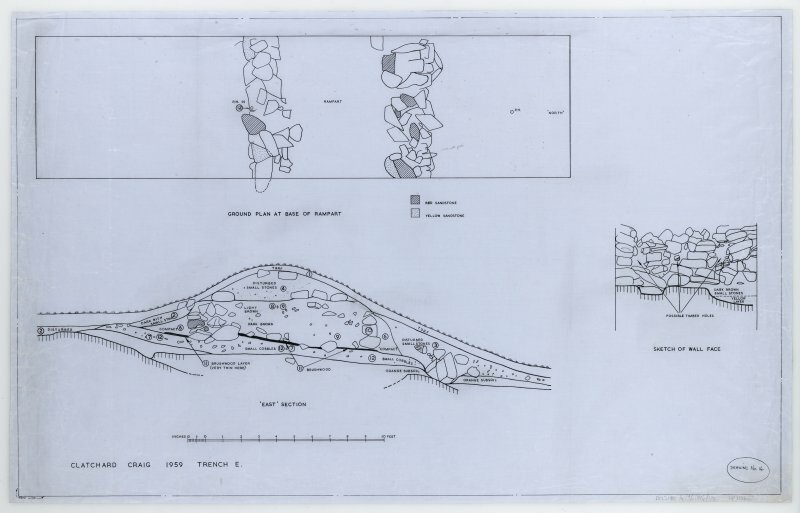 There are certainly curiosities in the lines of the outer ramparts, such as a break in the fourth rampart at its S angle and the possible entrance in the gully on the S to suggest that the history of enclosure here was probably more complex than the excavations revealed.